I am currently part of a closed beta program testing the all new cloud based Transport Management Service. It will offer a functionality comparable to the ABAP based enhanced Change and Transport System (CTS+) but without the need for an SAP NetWeaver application server coordinating the transports. Additionally the Transport Management Service allows not only the transport of development artifacts but also covers application specific content. It allows to model transport landscapes where the so-called transport nodes represent for example Neo subaccounts or Cloud Foundry spaces. 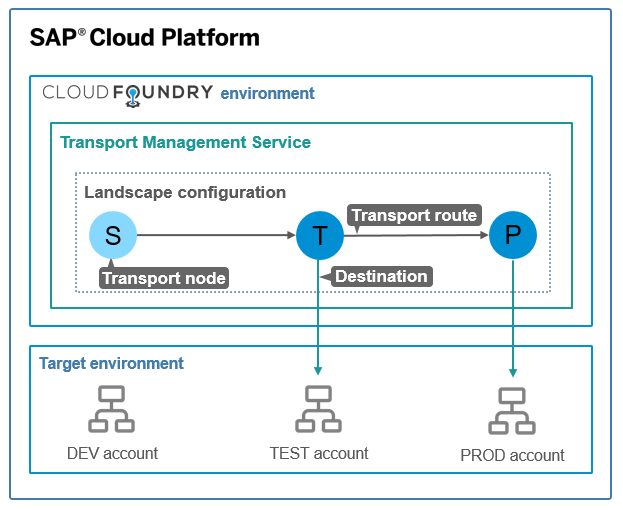 The nodes are connected to the ‘real’ transport targets via destinations using the standard SAP Cloud Platform destination service. The flow of the content to be transported is modeled with transport routes specifying a source and a target node. Using several transport routes you can model larger or more complex transport landscapes. The architecture of the Transport Management Service is quite flexible so that it will support a wide variety of content it can transport as well as different types of target environments. Currently we are transporting SAP Cloud Platform Integration (CPI) packages, Multi-Target Applications (MTA) and SAP HANA XS classic model delivery units. Especially the first example shows an area which has not yet been covered by existing solutions: the transport of application specific content. Here we are planning to support further scenarios in the near future. On the target environment side we are currently supporting SAP Cloud Platform Neo subaccounts and SAP HANA XS classic databases running in SAP Cloud Platform. The next step will be SAP Cloud Platform Cloud Foundry spaces. Now, let’s have a brief look into the Transport Management Service. The entry screen gives an overview on successful, failed and pending transports. It also allows navigation to configuration activities, log files and documentation. The Transport Nodes view shows all configured Transport Nodes. It allows the configuration of new nodes, as well as changing and deleting existing nodes. All changes to the configured landscape are tracked in the Landscape Action Logs. Here you can find the transport requests which are targeting this node. You can trigger the import of the transport requests and also access the logs of import activities. This view shows the Transport Routes connecting two Transport Nodes (source and target). By combining several routes you can setup more complex landscapes. In this example I have set up a linear landscape (ConsDev -> ConsTest -> ConsProd) and a star shaped landscape with one source (StarSource) and three targets (Star1, Star2 and Star3). As mentioned above the Transport Management Service is currently in beta testing. We are planning the global availability later this year. @f.lehmann (one of our early beta testers) already wrote a blog about his first experiences. @peter.gutsche provided a very detailed description how to setup the Transport Management Service for SAP Cloud Platform Integration, showing the ‘close coupling’ scenario. 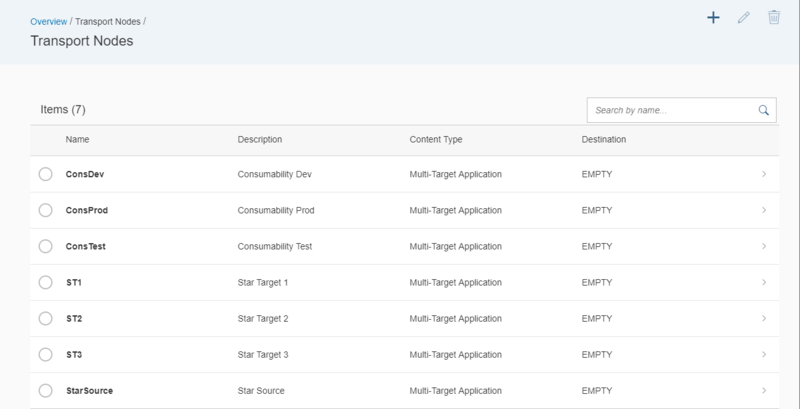 SAP Mentor @wouter.lemaire has written an excellent blog on the use of the Transport Management Service for transporting an SAP UI5 Multi-Target Application (MTA). This is an example for the ‘loose coupling’ scenario. I am also planning to provide you with further blogs about the Transport Management Service. Thanks Harald Stevens for the blog. A small question what if we have two SAP cloud platform( can be any reason for example two companies running their own instances merge) how will this work? This question is more from ABAP perspective where we have TOC files to be used between disconnected SAP systems. from the Transport Management Service it is possible to access subaccounts running in different global accounts (e.g. because they belonged to different companies initially). 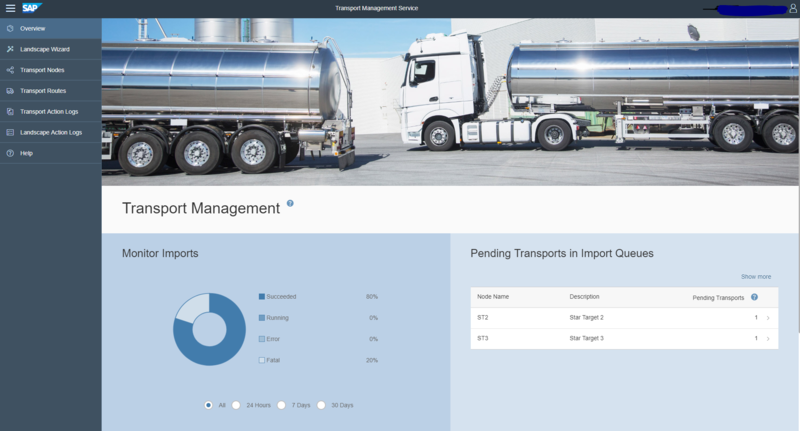 Transports can run across different global account or even data centers as long as the subaccounts can be reached from the Transport Management Service via a destination.